It's interesting to see how the incoming balls pass energy on to the stationary marbles. 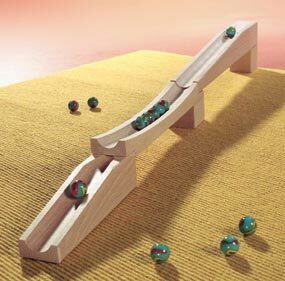 This set contains 1 impulse track, 2 ramps, 1 square block and 12 glass marbles. Ramp track measures 12.5" long. Made from solid hardwood. Compatible with all Haba building block sets (T.C. Timber not included).